I hadn’t really given Google CPA enough learning time – the more data Google has the better it should be able to do. The mighty Google brain might even be able to spot and exploit patterns I would find very difficult to emulate (e.g. based on season, country, day or week or time of day). I should switch from paying per sale to paying per download, as this would give Google an order of magnitude more data to work with. CPA bidding would require a lot less of my precious time to manage. So I switched back to CPA. This time measuring a conversion as a successful download and install (my table planner shows a help page in a browser on first run, this contains the Google conversion tracking script). So now, instead of having to choose thousands of bid prices (one for each keyword and match type in each campaign), I had to choose a single bid price – what I am prepared to pay Google for a download. If I pay too little for a download: Google won’t show my ads much, I won’t make many sales and my profit will be low. If I pay too much for a download: Google will show my ads a lot, but the amount I pay for each conversion will be high and my profit will be low. In between their should be a ‘sweet spot’ that gives me optimal profit. But how to find that sweet spot? Looking at analytics data I have a good idea at what rate Adwords traffic converts to sales. 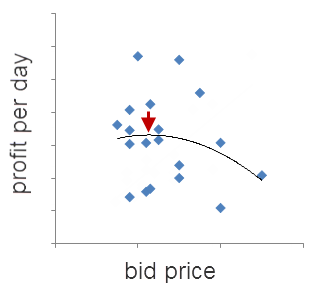 I chose a CPA bid based on this and then I randomly varied the bid up or down every 7 days (some days of the week perform consistently better than others for my product). The graphs below show the results. Each data point is 7 days of data. The black lines are linear trend lines. I deliberately haven’t put values on the axes, but the x and y axes are all linear, starting at 0. 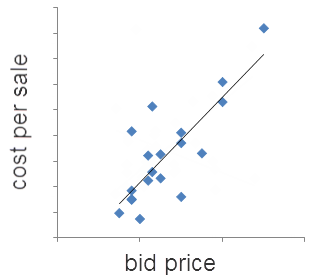 So higher bids means more sales, but also a higher cost per sale. But, of course, the really important metric is profit. So I worked out the average daily profit from Adwords traffic, which is the net sales income (gross sales minus sales costs, including payment processor fees and support costs) minus Adwords costs. Again each point is 7 days of data. The black line is a 2nd order polynomial trend line. The data is quite noisy. But some data is a lot better than none and there does appear to be sweet spot about where the red arrow is. 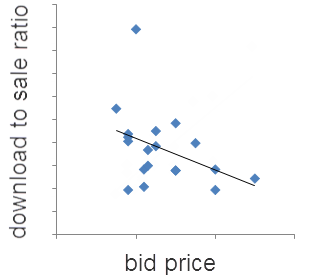 The curve is fairly flat meaning that I don’t have to be too precise in my bid price to get a near to optimal return. But if I bid twice the optimal price my profit will drop by about 35%. 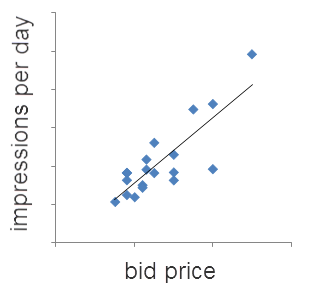 In an ideal world I would have run all these different bid prices concurrently, instead of one after the other. 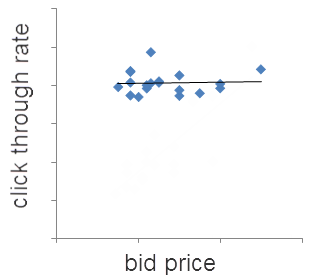 But that just isn’t possible with Adwords at present (you can use Google Adwords experiments to split test bid prices, but only 2 at a time). Also I could have gathered a lot more data, used longer time intervals (7 days probably isn’t long enough for Google CPA to get into its stride) and bid a lot higher and lower, to make the trends clearer. But I wasn’t prepared to spend the extra time and money required. If you are using CPA bidding you should be able to carry out a similar analysis on your own Adwords account to find your own CPA bidding sweet spot. If you are still using CPC, perhaps you should consider switching to CPA and let Google do some of the heavy lifting for you. You can switch any campaign that has 15 or more conversions per month to CPA bidding in the ‘Settings’ tab. You can always switch back to CPC later. If you aren’t using Google conversion tracking, well you really should be. A word of warning. Not all downloads are equal. You might think that download to sale rates would vary a lot less than impression to click and click to download rates (I did). 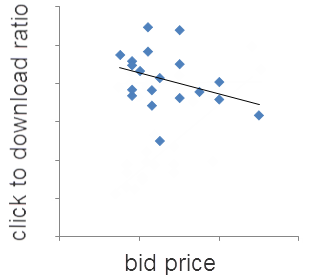 But download to sale ratios can vary a lot between different campaigns, even for the same product. For example, my analytics data shows that downloads from Adwords display (=contents/adsense) traffic only convert to sales at around a quarter of the rate of Adwords search traffic. So display campaign downloads are worth a lot less to me than search campaign downloads and I set my CPA bids accordingly. When using CPA bidding you should give Google more room to experiment. On search, this means using more broad match terms, or at least modified broad match. And less negative keywords (I removed a lot of my negatives lately). The idea is that Google will automatically find out what works and what doesn’t (again, this may take a lot of time). On the Content Network it means being less trigger-happy with the site exclusions. Without CPA bidding, I would be more likely to exclude generic sites like Facebook, about.com, etc… But with CPA bidding, I tend to allow the optimizer to display on those sites and the find the right pages within those sites to show my ads on. In my experience, the optimal CPA bid can vary (wildly) between products, campaigns, etc. . Content Network CPA’s in general tend to be much lower, for the same products. Strangely enough, content network visitor sign up (or downloads) are worth less than search traffic sign ups. Which wasn’t what I was expecting. Of course, content network traffic is less targeted in general so one would expect a lower sign up rate. But even if those visitors sign up, they convert less well to actual sales too. Tricky. This entry was posted in adwords, article, Google, marketing, software and tagged adwords, bid, conversion optimizer, cpa, cpc, CTR, Google, graphs, ppc, results on 12 July 2011 by Andy Brice.